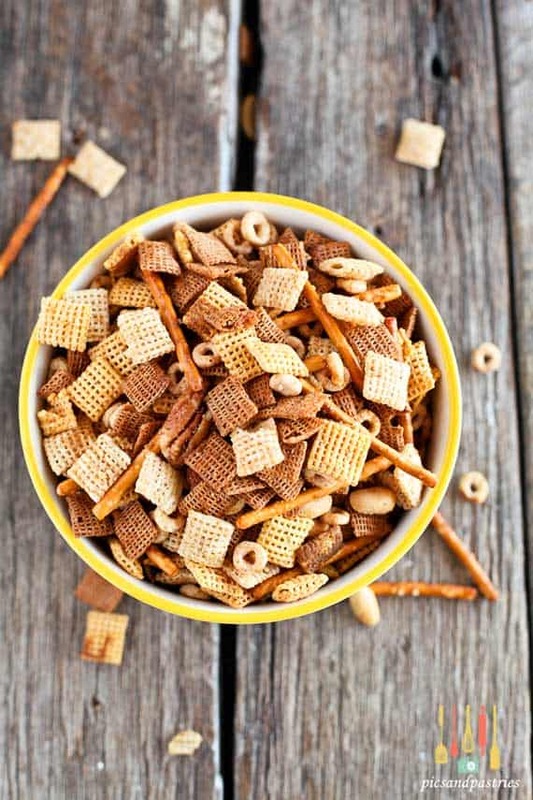 Chex Mix: Corn Chex, Rice Chex, and Wheat Chex Cereal, Pretzels, Toasted Oats, Peanuts, butter and spices all blended together to give you a classic snack recipe. In our family it’s tradition to make Chex Mix throughout the holidays. Often times I make two or three batches and share with our friends and family. We love homemade chex mix. Most “Christmas” recipes “I only enjoy at Christmas. Homemade Chex Mix is the exception though. I think of it more as a “winter” favorite. Kind of like these which I make at Christmas but also enjoy throughout the cold months of the year. Since I still have a couple of boxes of cereal I decided I would make another batch and probably one more for the upcoming BIG GAME. It’s bizarre not to have a handful of this at all times while watching sports. At least Football, during the BIG GAME, of course. After all football is kinda-sorta a winter sport and the big game takes place in the winter and this is a winter recipe….. Catch my drift? Sorry about the rambling, of course this is all my opinion only. If you want to make this for 4th of July, then AWESOME! Okay, enough about why and when you should eat it let’s talk about what’s in it. I really don’t stray too far from the original recipe. I’m wild and crazy like that. I do add plain toasted oat cereal and omit the bread things. Yeah, that’s how much I like them. I refer to them as “bread things.” HA! You can easily adjust the cereal amounts to your liking as well as omit and/or add things you prefer. In ungreased large roasting pan, melt butter in oven. Gradually stir in cereal mixture until evenly coated.